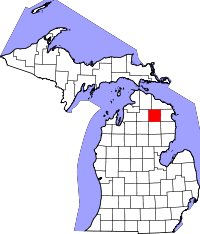 Montmorency County, known as the "Elk Capital of Michigan" as well as being a hugely popular hunting and fishing area due to the large varieties of game and fish found there, requires that vital records researchers and genealogists call the County Clerk office prior to arriving to ensure the office has sufficient staff to assist with searching records. Also, since space is limited to one researcher at a time, calling before visiting ensures that no research appointments overlap and conflict. The office allows research on Tuesdays, Wednesdays, and Thursdays from 8:30AM till noon, and again from 1:00PM until 4:00PM, and all records the office has indexed begin in 1881. Birth certificates dated from 1902 or more recently are only viewable by verified relatives of the original recipient; records dated beyond then, however, are open to the public. Individuals wanting to order copies of records are advised to use the VitalChek service, as well.